This is the second of 2 reviews that are a part of the Keep Watching the Skies! 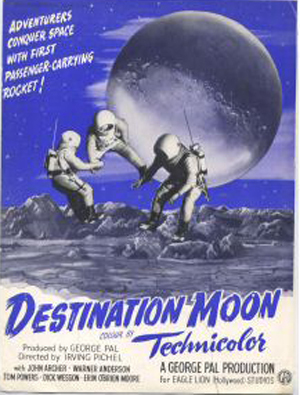 Science Fiction Movies of the 1950s Blogathon being run by Louis (Film Score Hunter) over at The Cinematic Frontier. Tnx for letting me participate! Brief Synopsis – A group of scientists try to find a way to beat the Russians and send a ship to the moon. My Take on it – I decided to watch this film solely due to the fact that the premise sounded like something I might enjoy. Being a fan of the US Space Program, I was quite happy to see the Woody Woodpecker short in this film that shows how things work when it comes to launching a rocket and landing a man on the moon. This clip was a lot of fun to watch. I assume that the people who make this somehow got in touch with people in the early days of the space program to give them some insight into how to make it all seem accurate enough. Unfortunately, besides the science seeming right, the rest of this film just seems quite laughable. The characters all fit the typical stereotypes, the jokes fall flat, the acting is wooden and the thrills are very vanilla and bland. Some of the scenes actually reminded me of the B-Movie scenes from Amazon Women on the Moon (1987) and that gave me a chuckle. This film definitely fits this blogathon because it really feels like a sci-fi B-movie. Bottom Line – Interesting how much knowledge they had when making this because much of the science seems to be right. The acting is quite wooden and the characters are too steroetypical. The woody Woodpecker animated scenes are the real highlight here of the film because it’s fun to watch. The thrills are a bit bland, but overall it seems to really fit the category of an early sci fi B-movie.